15 years ago today, Dandy was finishing off Bunny Camp News (we published the current issue yesterday) he was also becoming concerned about Flopsy Girl. 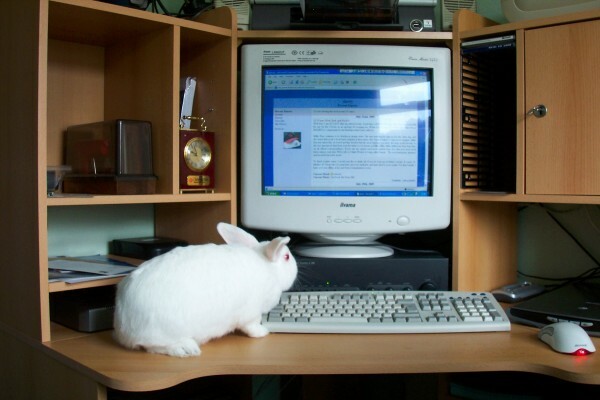 I'm sorry that I have not updated my journal this week until now, but every time I have been on the computer, I've been working on Bunny Camp News. Anyway, it's done now, and I will be e-mailing round later today. If you are not on the list and would like a copy, just let me have your e-mail address. On another subject, I'm a bit worried about how perceptive my 2-foot is. He tries bless him, but sometimes I'm not sure that he sees the obvious. Flopsy Girl is a bit under the weather, I think her mouth is a bit sore again, because it's been a while since she had her teeth done. Well I can tell you, she has done everything but tap my 2-foot on the shoulder and bring him the car keys! she has been fussing round him, trying to attract his attention, every time he turns his back, she has knocked something down, or made some kind of noise, or chewed his CD boxes, in fact anything to get him to take notice, but up to now, nothing, nil, zilch! Why hasn't he taken her to see Auntie Francis the vet? Patience is a virtue as they say. I'm sure that very soon your 2-foot will take notice.